The catastrophic destruction and profound trauma of this disaster have left their indelible mark on Haiti’s people, who have lived through one disaster after another. Although it will take years for the country to recover, AJWS is staying the course to support a constellation of grassroots organizations that are helping Haitians get back on their feet, and to invest in efforts to create lasting change. Our grantee Groupe d’Appui aux Rapatries et aux Refugies (GARR) worked around the clock to distribute water-cleaning kits and food supplies to hundreds of families in need, and spread awareness over the radio about halting the spread of water-borne diseases, reaching thousands of people. In the hard-hit coastal south, Gwoup Apui pou Devlopman Depatman Sid (GADES) is ensuring the needs of the most vulnerable—including women and LGBT people—are not overlooked in the aftermath of the hurricane. In addition to providing relief material, GADES has helped more than 150 trauma-stricken survivors access counseling, and it has raised awareness in communities to curb violence against women, which often skyrockets in times of crisis. Tèt Kole is ensuring the rural poor are not forgotten. With AJWS’s support, Tèt Kole is providing small loans and seeds to small farmers so they can replant lost crops to feed their families and communities and earn a livelihood. 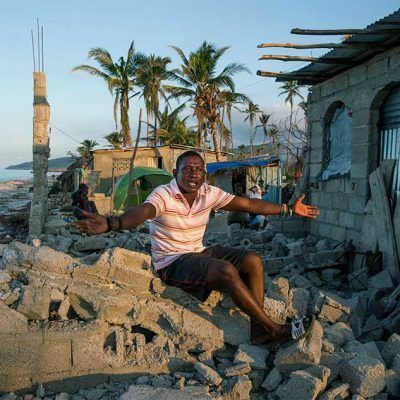 In addition to beaming warnings to thousands of Haitians during the hurricane, which helped spare further death, Radyo VKM continues to broadcast information so communities in need know where to get assistance. Despite threats, the station’s brave journalists are keeping watch over local relief efforts to ensure aid is not diverted away from those who need it. Click here to learn more about AJWS’s disaster response work. Explore these photos of destruction and rebuilding efforts in Haiti last November, just weeks after Hurricane Matthew touched down. In the weeks following Hurricane Matthew, Madjine Gilbert, with the help of her family members, rebuilds her damaged home in Gommier, a coastal village on the outskirts of the city of Jérémie. The coastal city of Jérémie, located in Haiti’s southern peninsula, was one of the areas hit hardest by Hurricane Matthew. In Jérémie, Mariangline Jane stands by what was left of her home following Hurricane Matthew. Homes and trees damaged in the aftermath of Hurricane Matthew in the small community of La Vine Blanche. Tèt Kole, a grassroots group supported by AJWS that advocates for the rights of peasant farmers, is working in this area to ensure communities can continue to produce food. Tèt Kole member Marceline Jeravil’s home and garden were severely damaged by Hurricane Matthew in La Vine Blanche. Neslie François facilitates a meeting of Solidarite Fanm Aysisyèn (SOFA), a feminist organization supported by AJWS, in one of the member’s severely damaged homes in Jérémie. Members of SOFA during a meeting in one of the member’s homes. Destroyed trees and damaged villages in the outskirts of Jérémie. Coconut, breadfruit and plantains are staple crops for many of the local farmers, but most of the area’s vegetation was destroyed by the hurricane. The severe damages to the building that houses the Groupe de Recherche et d’Appui au Milieu Rural (GRAMIR), an organization supported by AJWS, in Jérémie. The water line on the wall indicates the extent of the flooding during the hurricane. Homes that were severely damaged during Hurricane Matthew in Port Salut, a coastal town in Haiti’s southern peninsula. Youth in a meeting organized by Gwoup Apui Devlopman Departman Sid (GADES), an organization supported by AJWS that works to protect women and girls from violence in Port-à-Piment, a coastal town in Haiti’s southern peninsula. Nico Aseau, his wife Perlage St. Rose and their three children in the remote village of Gwo Woch that was severely hit by Hurricane Matthew. AJWS supported the rebuilding of their home and others in the village through the local organization Bureau des Droits Humains en Haiti (BDHH).